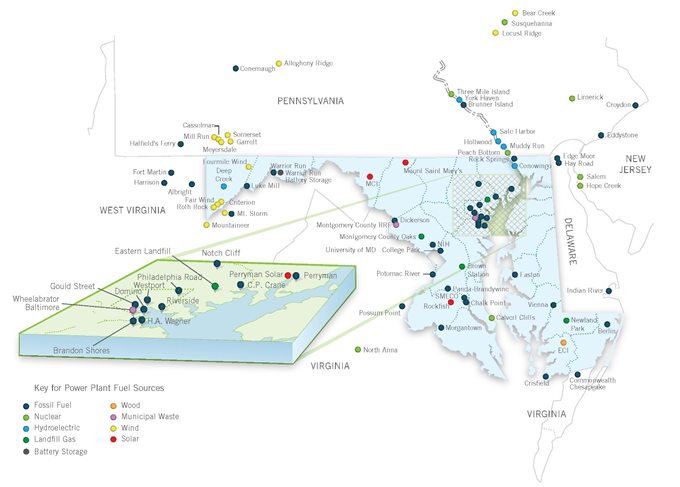 Currently in Maryland, 55 power plants with generation capacities greater than 2 megawatts (MW) are interconnected to the regional transmission grid. Table 2‑1 lists the individual power plant sites; Figure 2‑1 shows the plant locations (with the exception of solar installations under 10 MW). In aggregate, Maryland power plants represent over 13,753 MW of operational capacity. 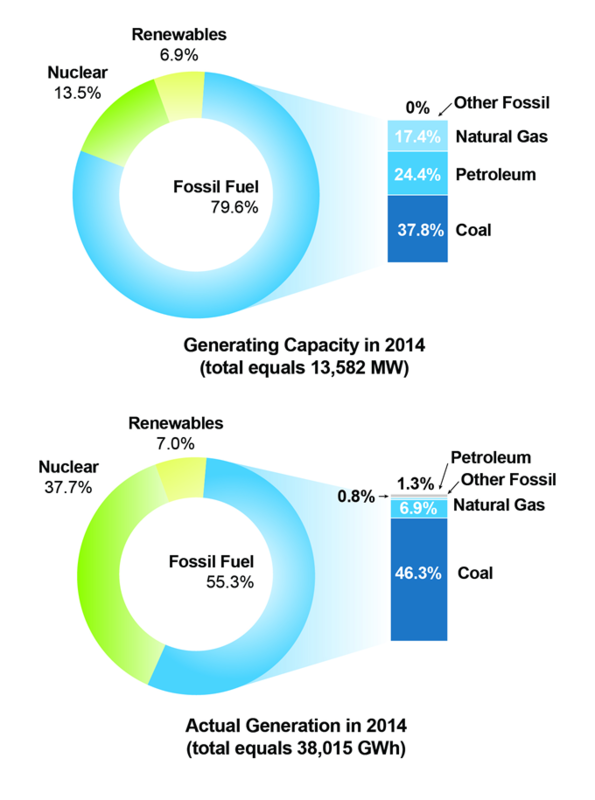 The largest portion of Maryland's generating capacity comes from fossil fuels (see Figure 2‑2), with the remainder attributed to nuclear and renewables. Source: U.S. Energy Information Administration, Form EIA-860, 2015 Early Release. Source: “Existing Nameplate and Net Summer Capacity by Energy Source, Producer Type and State (EIA-860),” U.S. Energy Information Administration, October 21, 2015, https://www.eia.gov/electricity/data/state/; “Net Generation by State by Type of Producer by Energy Source (EIA-906, EIA-920, and EIA-923),” U.S. Energy Information Administration, October 21, 2015 https://www.eia.gov/electricity/data/state/. Note: EIA data for generation contains the fossil fuel category, “Other,” which is not included in EIA data for capacity. The generating capacity of a power plant is the maximum amount of power it can instantaneously supply to the grid and is measured in megawatts (MW).Electricity generation is the amount of power supplied through time (energy) and is measured in megawatt-hours (MWh).